The ATS Container cleaning facility is conveniently located in the Bayport Industrial Complex, Pasadena, Texas. 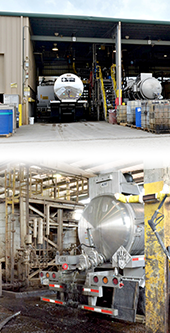 The facility is state-of-the-art and specializes in hard-to-clean or otherwise hazardous materials including, reactive, odorous, oxidizers, toxics, halogens, gases, polymers and RCRA hazardous waste. ATS manages the vast array of mixtures and pure chemicals cleaned with the aid of a custom designed IT work order process system that provides the managers and technicians with detailed technical information specific for each job. This assures that the containers are cleaned safely and emissions and all residues removed are handled specifically to their individual regulatory requirements. This approach to safety and compliance competently reduces the liability and risk to the customer.